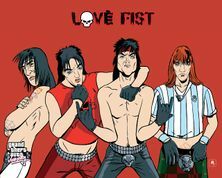 Love Fist, the Scottish hair metal band that created the album. Dogs On Heat is the first Love Fist album. It contains four songs, which are featured below. Love Fist is featured in Grand Theft Auto Vice City. This page was last modified on 29 January 2013, at 15:31.